When you are using your golf course mower, make sure that the speed is 3 to 5 mph. This speed is ideal and safe as well. The mower cuts grass thoroughly and clearly. The mower will start bouncing if the speed is increased beyond 5 mph. The mower will cut the grass unevenly. If you don’t slow down the equipment while making sharp turns, it will damage the turf. Try to make gradual and wide turns. It is important to establish mowing patterns. Grass leans in the direction of mowing. Each time you mow the turfgrass, make sure that the patterns are moving at different angles. By doing so, you will be able to avoid turf wear and soil compaction. Try to minimize turns while using patterns. Do this to reduce turf damage due to the wheels of the mower. This will also decrease mowing time. If you are not maintaining your Toro golf course equipment, you can’t maintain your golf course. No matter whether you have purchased brand new equipment or you have purchased used turf equipment for sale, service and maintain it regularly. A properly maintained equipment operates more efficiently and also lasts longer. Clean and check the equipment when you call it a day. Avoid using a dull blade. Remove excess grass and dirt. Follow the manual to check all fasteners, clean air filters, and all other parts. Avoid spilling while filling up with gas. Check the oil level before refueling. Don’t do anything without following the manual. Create a regular, weekly and monthly maintenance schedule. Be careful while using power mowers. 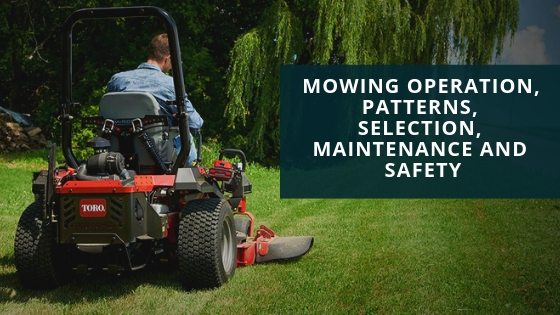 These golf course mowers can cause serious injury. Operate these mowers only when you know how to operate. First of all, be familiar with the mower or any other Toro golf course equipment you are going to use. Consider safety first. Read all the safety instructions. Always wear slacks or full-length jeans. Learn about all the controls. Learn what to do in case of an emergency. Make sure that there are no stones, sticks, wires and debris. Make sure that all safety features are working. Always keep your feet away from blades. Don’t pull the mower, always push. Be watchful on wet grass and steep slopes. Refuel only when the engine is shut off and cool. Avoid refueling in turf areas. Don’t work on the engine or blade without stopping the engine and disconnecting the spark plug wire. Go for reel mower if you want a smooth cut. It is energy efficient and runs quietly without throwing hard objects. It doesn’t scalp on uneven ground. It is ideal for close-cut turf. However, it cannot cut high grass. It requires more maintenance and care. A rotary mower can easily cut high grass. This golf course mower is easy to sharpen and maintain. However, this mower is very noisy, can scalp uneven and consumes more power. What All Is Noticed About The Child Care Center To Determine The Reputation?